The NHL season is now exactly two months old, and as the calendar churns towards Christmas the Buffalo Sabres find themselves in a familiar place: looking up at the rest of the Eastern Conference. While the team is only six points back of third place in the Atlantic Division with a few games in hand, the team needs to start stringing wins together in order to get back into the playoff conversation. As fans and pundits alike look for ways the Sabres can jumpstart their season, many are of the belief that the answer may lie with Anders Nilsson, at least for the time being. The first year Sabre and fourth year NHLer is enjoying a career renaissance in Buffalo under the tutelage of goalie coach Andrew Allen. Nilsson has compiled a 5-2-2 record with a 2.38 GAA and career high .932 save percentage to date, and many believe the Sabres should stick with him in net while he continues to pile up the impressive numbers. Robin Lehner would stand to lose playing time as a result of an extended string of starts for Nilsson. Lehner’s stat line isn’t anything to sneeze at either, as he’s posted a 2.44 GAA and .920 save percentage, yet only has a 5-9-4 record to show for it. When looking at the records of the two netminders in question it’s pretty clear that Nilsson has been more successful, but is he really on the hot streak many people think he’s on? I tend to disagree. Nilsson started off the season in impressive fashion, posting a 1.74 GAA and .951 save percentage in his first five appearances, good for a 2-1-2 record. The last four appearances haven’t been quite as good, as Nilsson has put up a 3.27 GAA and .902 save percentage, but has gone 3-1. That .902 save percentage is on par with the .901 he posted with the Islanders in 2013-14 and led to him having to find work in the KHL the following year. Robin Lehner’s last five appearances (including one injury shortened cameo in Ottawa) tell a different story. His 2.28 GAA and .919 save percentage are right in line with his stat line for the entire season, but sadly the 0-2-2 record also follows the trend of Lehner not getting rewarded with wins. The Sabres’ offense has also managed to locate the net with more frequency during Nilsson’s appearances. In games in which Nilsson is the goaltender of record the offense has provided 2.44 goals per game (not including the shootout); when Lehner takes the result the Sabres put up 1.84 goals per game. The offensive output when Lehner is in net is even aided by the six goal outburst in Edmonton, when that game is removed it reveals a grisly 1.61. The Sabres have scored two goals or less in 14 of the 18 games in which Lehner has gotten a decision, including a stretch of eight in a row. In the nine games in which Anders Nilsson was the goaltender of record they have scored three goals or more five times. This isn’t to say the Sabres transform into the Oiler’s of the early 80’s whenever Nilsson starts, but an extra half goal per game certainly wouldn’t hurt Lehner’s won-loss tally. As it stands now, Lehner needs to post a goals against average at 1.83 or better to start racking up wins, a feat that’s only been achieved five times in the entire league since 2000. Really, he probably needs to post a GAA at 1.50 or better; a number that hasn’t been touched since the 1940s. Only Brian Elliott’s 1.56 in 38 starts with St. Louis in 2011-12 comes close. Those are the type of numbers Lehner would need, something that goes beyond simply stealing games. It’s basically shutout or bust territory. Lehner also outperforms Nilsson when the Sabres are shorthanded. Lehner’s .870 save percentage isn’t quite setting the league on fire (he ranks 26th in the league among goalies with at least eight appearances), but it does look good compared to Nilsson’s .851, which places him 35th of 49 goalies. It’s been well documented, at least by this blogger, that the Sabres’ penalty kill is absolutely awful, so it’s difficult to nitpick at the goaltenders too much when it comes to this. The biggest stat based reason people have begun to angle for Nilsson to get more opportunities is that Robin Lehner has struggled mightily in shootouts. The Sabres currently stand at 1-3 in shootouts, and have Nilsson to thank for their only victory in the skills competition. Nilsson’s 1-1 record is highlighted by his stonewalling of the Penguins, and he has been able to come up with a save on four of six attempts. Lehner has somehow managed to come up empty on four attempts. Lehner’s inability to come up with a save in the shootout is something he is certainly cognizant of, and he said as much after the Red Wings torched him. While Nilsson’s career shootout record is much more impressive than Lehner’s, in my opinion it would be foolish to give a goaltender the majority of starts based on the rare possibility of a shootout taking place. Another area in which Nilsson has outperformed Lehner five-on-five save percentage. As Mike Harrington pointed out in his column last week, Nilsson sits at a gaudy .957, while Lehner checks in with a rather pedestrian .926. Nilsson’s .957 leads the league among goaltenders who’ve played at least 8 games and Lehner stands at 18th. Sprinkled in among those 17 names ahead of Lehner are Jimmy Howard, Antti Raanta, Scott Darling, Mike Condon, and Andrei Vasilevskiy; backups who have not seen regular time starting (with the exception of Howard who is enjoying something of a career renaissance). In fact, nearly half the goaltenders ahead of Lehner (eight, to be exact), have played 14 games or less, which is less than half of their respective teams’ games played. When the sample size is expanded to show goaltenders who’ve played at least 18 games, or roughly two thirds of their team’s games, Lehner suddenly in the top ten (tied for 9th), and ahead of goalies such as Ben Bishop, Henrik Lundqvist, Martin Jones, Jake Allen, and Corey Schneider. What can somebody take from this? Lehner isn’t nearly as poor at even strength as you’d think, and Nilsson, while impressive thus far, is likely to regress a bit in this area. 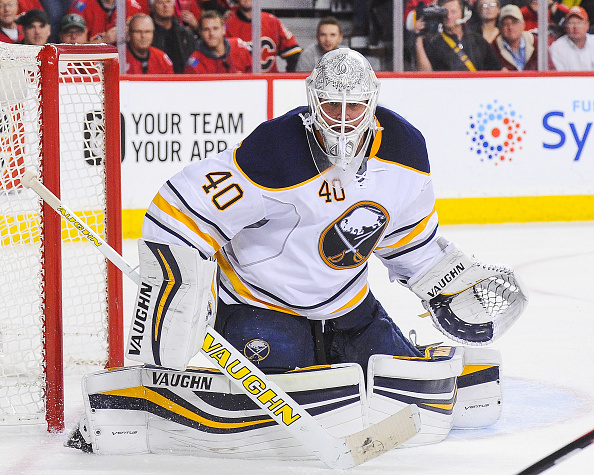 The desire (or need) for a Sabres netminder to steal a game or two has been expressed by many. What qualifies as “stealing a game” varies from person to person, so it’s difficult to say definitively who has stolen more games when it comes to Lehner and Nilsson. Nilsson has registered the only shutout by a Sabres goalie this season, albeit in a relatively low stress performance against a struggling Panthers team. He also was the reason the Sabres were able to take two points from the Penguins, registering 46 saves in addition to going three for three in the shootout; I think everyone can agree that Nilsson definitely stole that one. Apart from the Penguins game the only stand out moment from Nilsson’s season to date is the big save on Connor McDavid that helped the Sabres to an OT win, and while that was a key moment in the game I don’t think that qualifies as stealing the win. Lehner’s season to date is also lacking when it comes to a sort of marquee performance. Lehner’s best effort of the season may have been the 32 save effort in Ottawa that kept the Sabres in the game long enough for them to come back and register a 2-1 win. His 37-save victory in Winnipeg is probably the most impressive win he’s posted this year, although I’m not sure if that qualifies as “stealing” a game. Lehner has given up only one goal in five of 18 games, not counting the one period he played in Ottawa a few weeks ago, and has given up two goals in another five games. That equates to allowing two goals or less in over half the games in which he has gotten a decision. Anders Nilsson has given up two goals or less in only three of nine games in which he was the goalie of record, albeit with a smaller sample size. While neither goalie has stood on his head for a game, Pittsburgh notwithstanding, Lehner has been able to keep teams to under three goals in over half of his games, while Nilsson has managed to do so only a third of the time. When your offense only averages two goals a game that stat cannot be understated. While the numbers of Nilsson supporters seem to multiply with every loss pinned on Lehner, I can’t help but feel that the circumstances in which Lehner joined the organization aren’t helping his cause. Lehner was part of the blockbuster with Ottawa that sent a 1st round pick to Canada’s capital. There are certainly a fair amount of people that believe you shouldn’t give up a 1st round pick for a goaltender no matter who the goalie is. While that is an opinion that I tend to agree with, I think Lehner has held up his end of the bargain when it comes to this trade. An argument can be made that management needs to justify the price they paid to get Lehner, and to do that he needs to play. When you look Lehner’s .922 save percentage over 40 games with the Sabres would’ve placed him in the top five last season. At the end of the day, the decision on who should see the majority of starts doesn’t hinge on which goalie was acquired for the higher pick, or who is making the most money; the guy who gives your team the best chance to win will be between the pipes. Despite Lehner’s relatively poor record, his recent stats and ability to keep teams under that very important three goals per game benchmark make him the best choice to see the lion’s share of starts going forward.